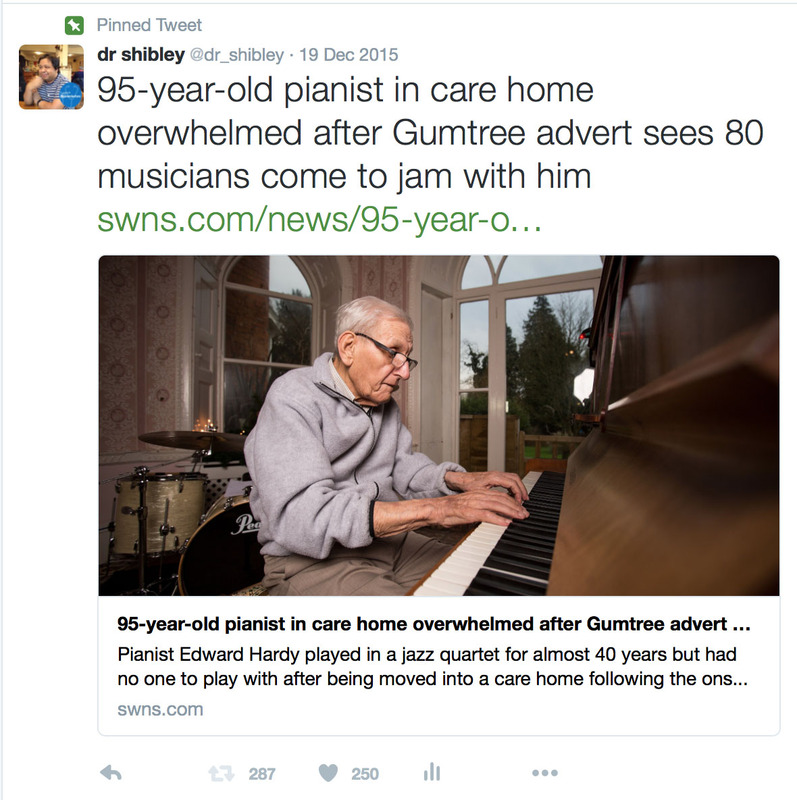 How did my tweet on music and care homes end up 'going viral'? Just before christmas, I made a quick tweet as follows. Since then, I have watched this tweet progressively get retweeted to the point of ‘going viral’. At the time of writing, it has had 287 ‘retweets’ and 250 ‘favourites’. Of course, no one can predict how, why, or when a tweet might go viral, though plenty of people have speculated on this phenomenon. Here is one example. In case you missed it, the story begins as follows. “Pianist Edward Hardy played in a jazz quartet for almost 40 years but had no one to play with after being moved into a care home following the onset of dementia. The home in Somerset, was inundated with more than 80 requests from across the UK, including from three former band mates who he hadn’t seen for 35 years. Mr Hardy had set up his first band when he returned from serving in Japan in World War II, but had become depressed when he recently moved into the care home initially leaving his wife for 75 years, Betty, 91, at home, and was diagnosed with dementia.